A Tongan/New Zealand weightlifter has won a prestigious award at the Commonwealth Games for outstanding sportsmanship in helping a Samoan weightlifter. 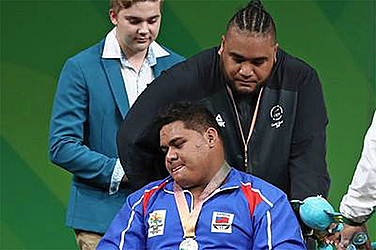 Kiwi gold medallist David Liti was presented with the David Dixon Award at the closing ceremony of the Commonwealth Games for his kind gesture and words of respect for his friend and weightlifting rival Lauititi Lui who injured himself in competition. Lui injured his knee badly while attempting to lift 228kg in the clean and jerk, ultimately settling for silver.